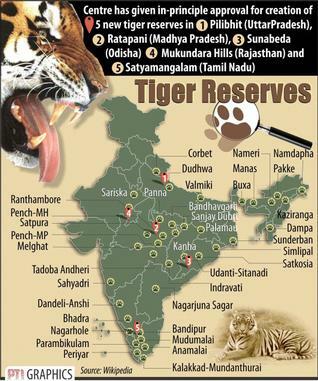 Mukundra Hills Tiger reserve: Mukundra Hills National Park is one of Five Tiger reserve announced by Govt. of India in August 2012. The proposed Mukundara Hills Tiger Reserve constitutes three wildlife sanctuaries including Darrah, Jawahar Sagar and Chambal. An erstwhile royal hunting preserve of the Maharaja of Kota, it is a thickly forested sanctuary lying along the southeastern border of Kota. This hilly sanctuary with thick forests is worth a visit. The animals here include Wolf, Sloth Bear, Chinkara and Leopard. This sanctuary is stretched in the area of 250 sq Km, around 50 Km from Kota. Environment Minister Jayanthi Natarajan in the Rajya Sabha today.